After Christmas, Thanksgiving, and the Fourth of July, Halloween is my favorite holiday of all time. It’s the one day of the year it’s okay for little kids to knock on strangers’ doors. And it’s the one day of the year for strangers to innocently hand out delicious candy to little kids. It’s awesome! Needless to say, it really skinned the skin off my mole-ridden back when I surpassed the maximum trick-or-treating age. It happened in 7th grade — my armpits sprouted hair, my chin sprouted pimples, and my body sprouted a milk gut (actually this all happened a few years earlier, I just didn’t acknowledge it until 7th grade). It was time to hang up my double-layered Shaw’s bags and retire the Beavis mask I’d rocked for the past five Halloweens. I was 13-years-old and instead of sorting through my candy collection, I was sitting at home with my parents watching Halloweentown (one of the best DCOMs of all time). 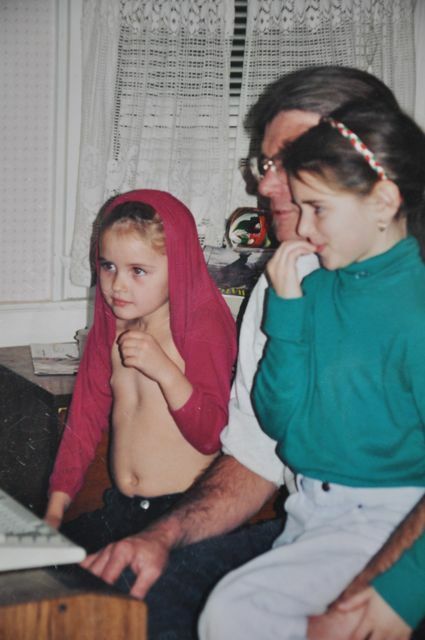 My dad had probably just cooked spaghetti with meat sauce, I’d probably just eaten three servings of it, and the torn, yellow pit stained T-shirt I was wearing was probably covered in red tomato stains. On any other day, it would have been a normal, down azz evening. But on Halloween, it sucked big ol’ biggity balls. Because it was such short notice, I didn’t have a costume. 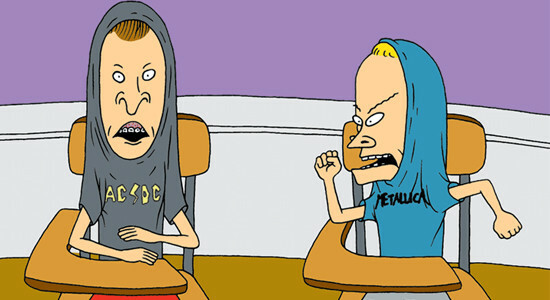 Well, I still had the Beavis mask, just no time to write “Metallica” on a fresh blue tee. Once again, my dad came to the rescue. He handed me his leafy camouflage hunting suit. The only hunting my dad did was sitting in a tree stand reading, napping, and using binoculars to watch deer as they passed by. As a result, he didn’t really need to use the camo suit, and he hadn’t stored all the pieces together. He had the pants and the top, but the hood was missing. I came up with a solution. I was 13 — an age when most kids exchange trick-or-treating for parties with friends — wearing a camo leaf suit and a huge, rubber Beavis head. I was approaching neighbors’ doors by myself, my dad trailing close behind in the family mini-van. I must have recognized how strange the situation was because I did my best to avoid other trick-or-treaters. I was embarrassed because of 1) my age, 2) my solitude, and 3) my big, leafy, Beavis costume. So I was pretty pumped when my branches rustled into an 8th grader from my field hockey team (apparently if you go with friends, it’s okay to trick-or-treat when you’re old). Her name was Savannah; she was semi-popular — certainly more popular than me — and was working hard to blow up my spot. She, her group of friends, and I happened to walk up to the same house at the same time. She started yabbing something about Halloween to me and, in fear that she might recognize my weirdo foreign-sounding voice, I played dumb. I didn’t say a word. Literally. I didn’t respond to anything she said, even when she directly asked me who I was. 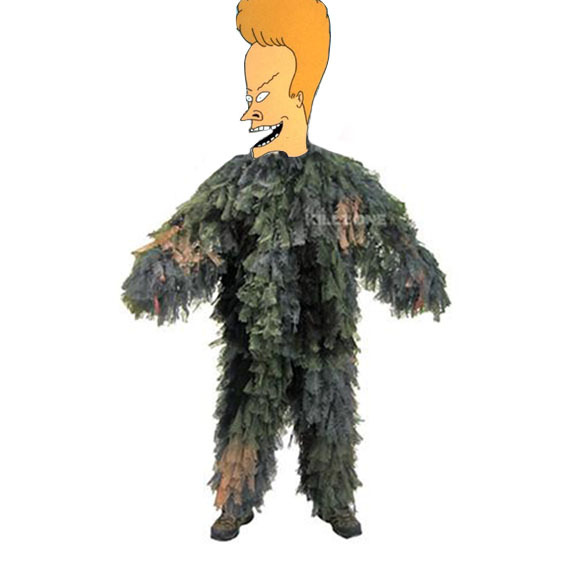 I kept my Beavis head on straight and worked that leaf suit like I ain’t never worked a leaf suit before. By the time she gave up, I was more than ready to jump in the van and tally up my haul. I did. It was worth it. This entry was posted in Uncategorized and tagged classy, halloween, holidays, humor on October 18, 2011 by classygallie. bet she thought there was a hot dude in that suit. that’s what all her chatter was about! That little girl in the picture above with the green turtleneck most certainly went trick or treating well past seventh grade, I can contest to that. Getting yo self knocked up will also ensure trick or treating for nearly a lifetime. Do you think 3 month old baby Nolan knew what the fluff was going on? No sir re. But Mama got a hefty selection of candy by the end of it. just bring heidi this year! Ashly is right, in fact when 7th grade allie was rocking the leaf suit, 9th Grade Ashly and I were going door to door in Standish. I freaking love Halloweentown. Not so much the sequels. Those were totally unnecessary. I love Halloween too. I remember how I felt when I had to give up trick or treating…bad! Yeah it was seventh grade alrigh I had to stay home and pass out candy while my younger brother and sisters dressed up and headed out with kingsize pillow cases. I felt like Linus in the pumpkin patch coming to grips with the fact there is no great pumpkin…ughh. 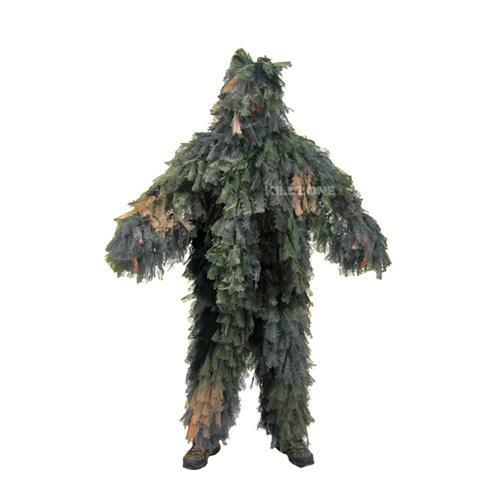 But more than anything, I remember when Jason Petereson showed up at my doorstep in a costume not clever enough as a leaf suit to hide is identity. “You’re too old to be trick or treating,” I declared with vengeance. He grabbed a handful of candy out of my plastic orange pumpkin and ran off laughing. I was soo mad. Looking back, I think iwas more jealous than mad. He got all the loot and I got an empty plastic pumpkin. It was my father who was mad when he found his car covered in shaving cream and toilet paper the next morning. Jason sounds like a real crapster — I hope you put razorblades in that candy!